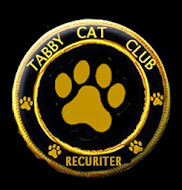 Cherry City Kitties : I'm over at the Tabby Cat Club! That was cool! Mes saw lots of my furrends there with their names too! Mes should join, even though me is a purebred lilac point, me has the M on my head!